2010’s Best Songs & Videos on iPhone or Android! 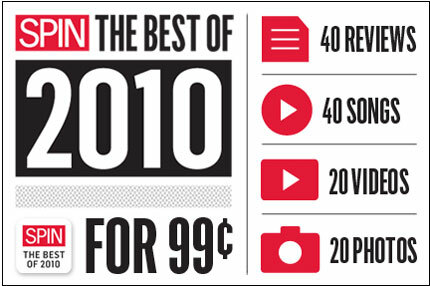 Download SPIN's Best of 2010 app and stream 40 of the year's top tunes, plus videos and photos for just 99 cents. SPIN’s Year in Music issue chronicles the best of 2010, and now, for the first time ever, you can get unlimited streaming of 40 hand-picked tunes from our 40 Best Albums of the Year – plus our 10 Best Videos and 20 Best Photos on your iPhone or Android, for just 99 cents! Plus, you can watch 2010’s top music videos, from Janelle Monae’s dance spectacular to OK Go’s puppy-powered “White Knuckles,” and gorgeous photography from the pages of SPIN, including shots of Eminem, Kings of Leon, MGMT, and many more. For iPhone: Click here to launch the iTunes Store and download the app! 1. Open “Market” on your Android-powered device. 3. Touch the listing for “SPIN’s Best of 2010″ app. * – 3G or WiFi connection required to stream music.